Plain of Jars is not an archaeological euphemism - the site literally is a plain of jars and how could I resist being only eight hours away and not visit to complete the triumvirate of megalithic archaeological sites including Stonehenge and Easter Island? After a marathon minivan journey from Luang Prabang I arrived in Phonsavan just before dark. The first thing to do was arrange a tour for the next day. This turned out to be quite the marathon process as well and involved checking in various restaurants for groups willing to add a solo traveler. 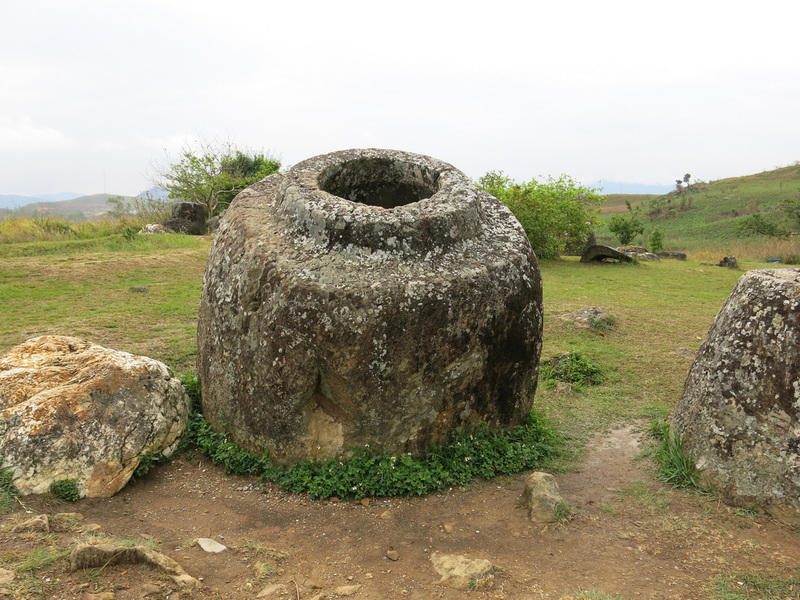 The Plain of Jars sites themselves would take about a half day to see so a wide range of additional destinations such as waterfalls, Hmong villages, bomb recycling, etc. are available to complete a full day tour of the area. LVE: HENRY KISSINGER AND CO. The unintended consequence of having completely customizable tours versus a standard pre-set tour was that as a solo traveler you were left on your own to track down smaller groups, compare their itineraries, and then see if they’d be willing to add you to their group and receive a price reduction. Fortunately I found a group that planned to visit all three of the nearby Jar Sites and would also visit two other sites in the vicinity. Phonsavan may be a looming UNESCO world heritage distinction but it still has a nascent tourist industry. The town itself has a bit of a wild west feel - makeshift nature of a new capital yet a few recent hotels and restaurants foretell of the coming potential tourist goldrush. Phonsavan is the capital of Xieng Khouang, which holds the distinction of the most bombed province - walking through Plain of Jars its evident how the historical site and bombings intersect - Plain of Jars pathways were marked with MAG stones indicated the pathway was safe. There were also huge craters that hollowed out the ground next to a cracked jar. The unexploded bombs have also caused a delay in the UNSECO recognition. I arrived early the next morning at Plain of Jars site one. At the top of a ridge, I looked down and in the open expanse below were hundreds of stone jars. When we were closer to the site you began to see how massive the jars were and the mystery of their purpose and how they were placed here from hills miles of way started to get deeper. The jars were different sizes and had an open carved in from the top. The second site was up a road of mud - it had just rained and the minivan could not make it up so I wound up walking the rest of the way to the site. My shoes quickly became a brick of mud and I felt about two inches taller - the mud reminded me of youth soccer games as I pried the mud of my shoes using an available twig. The second site was secluded under trees and created an eerily field than the open plain setting of site one. There were not as many jars but there were a few trees that were growing out of the jars that were interesting to look at. Between Plain of Jar sites I stopped at a “spoon” village. In a basic tale of making lemonade out of lemons, villagers of Phonsavan resorted to recycling bombs. Metal was melted to make silverware, key chains, and other mementos - the most common being a spoon, hence spoon village. The worker sat three feet away from the fire and ladled the liquid metal out of the furnace and into a wooden mold. After a few minutes to cool off the mold open and the liquefied bomb was transformed into a spoon - a simple and symbolic way to go from destruction to fine dining. The next stop was Plain of Jars site three. It was a bit of a walk along rice terrace ridges from the parking lot to site three. There was a similar style of jars - but this site felt like a combination of sites 1 and 2 - wooded and plain. I was here to see the jars but after this site I think I hit my jar limit and was glad there were a few other sites of interest to partake. The final stop was Muagn Khoun, the former province capital. The capital moved to Phonsavan due to heavy bombing and the remnants of the bombing was the attraction - destroyed Buddhist temple, French Hospital, and Buddhist stupas. Muagn Khoun was the farthest point on the route and it was about an hour ride back to Phonsavan. After a day of tour the Plain of Jars and other peripheral sites I visited the Mines Advisory Group (MAG) offices for their nightly movie screenings. Three films are shown between 6-8 each night that show the impact of the US bombing and recount personal experiences of ruined lives. For a country where 80% of its citizens practice subsistence farming the debilitating effect of an explosion makes life exponentially difficult. Unlike the Cambodian bombings which were done strategically to interrupt the Ho Chi Minh supply chain that ran through the NE part of the country, the bombing in Laos was a convenience and US Air Force safety precaution - the Air Force didn’t want armed planes returning to base less the bombs detonate on landing, therefore, pilots were instructed to detonate their payload in Laos. The commonly reported facts are that the US dropped more than two million tons of bombs on Laos starting in 1964 and escalated activity through 1973 - this is the equivalent of one B-52 bomb-load every eight minutes, 24 hours a day. The B-52 isn’t exactly a prop-plane. Complicating the international cleanup post-bombing is multi-fold: 1) The US did not acknowledge the bombing until 1997, 22 years after the Vietnam War ended; 2) The US lost the war; 3) Laos is poor and unlike it’s SE Asian neighbors lacks natural resources and tourism opportunities. Thus, the US has made very little effort to rectify or cleanup the bombings. 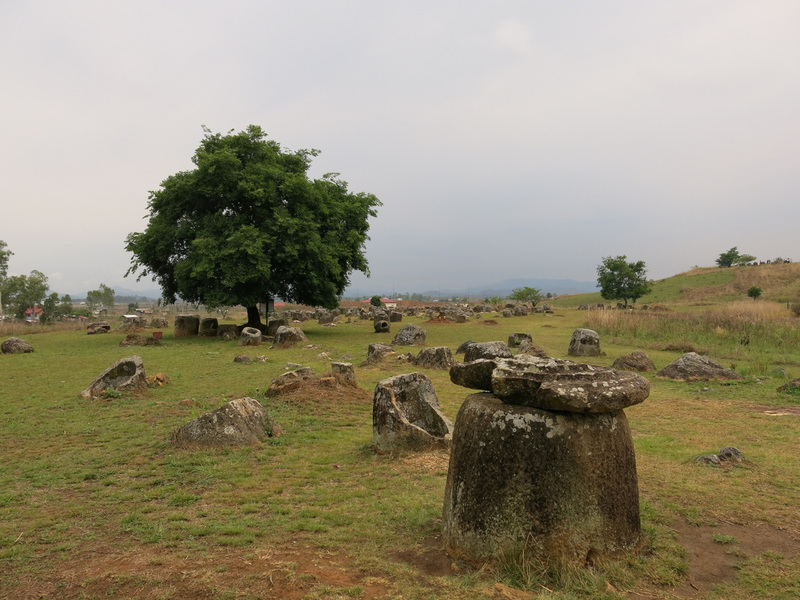 For additional Plain of Jars photos see FLIKR ALBUM.